We will be happy to assist you with your fitting needs. After breast surgery, many women feel they will never be whole again. 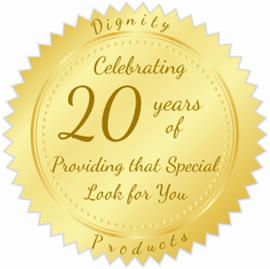 At Dignity Products, we believe physical and emotional healing go hand in hand. A caring attitude, private supportive environment, and attention to your individual needs help to enhance that emotional healing. We further believe that life should be about choices....do I want to wear a black or white bra today, or maybe one with lace or even a smooth cup mastectomy bra? We constantly strive to provide not only a mastectomy product, but a valuable service. You can go anywhere to buy mastectomy products, but we provide the caring service before the sale. As we assist you with your selections, we want you to be more informed about product choices which allow you to be in control. has been re-introduced in Congress. If passed, new legislation will provide Medicare coverage for custom breast prosthesis. The Introduction of this act was an initiative of Essentially Women and People for Quality Care, divisions of VGM Group, Inc.
Lymphedema Treatment Act re-introduced in Congress.